It’s been a month since the Backstreet Boys released their new single, “Don’t Go Breaking My Heart,” and it’s slowly climbing it’s way to the top of the charts. Members of the BSB Army have been fast at work to help with that promotion. Whether it’s calling into local radio stations or tweeting their favorite DJ’s, the army has been hard at work. 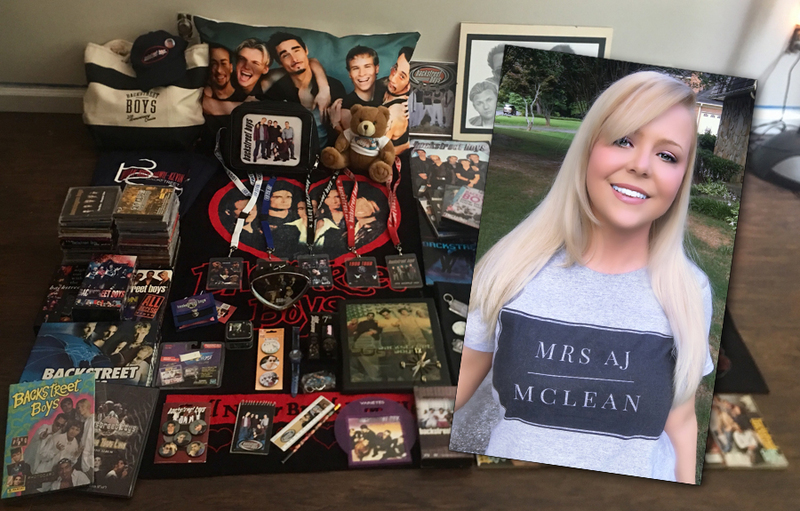 Cat Malone of Atlanta, Ga. has done something a little different than most fans and that’s why she’s the June 2018 Soldier of the Month for the Backstreet Boys’ fan club. 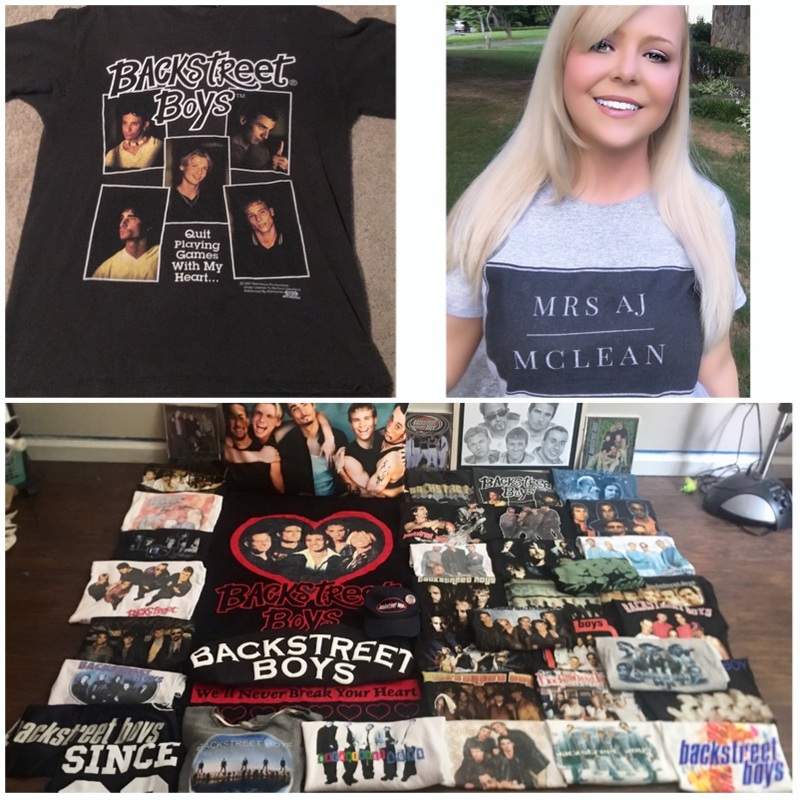 Malone, who runs a huge Backstreet Boys meme Instagram account (@backstreetboysmemes) not only has been calling her local radio stations but put her collection of over 40 Backstreet Boys T-shirts to work… at work. And her dedication to the boys was well received by her co-workers. Out of all of her shirts, one that was custom-made is one of her favorites and it’s dedicated to her favorite member of Backstreet Boys. The meme maker, who became a Backstreet Boys fan at the age of 9, and can wear a different Backstreet Boys T-shirt for an entire month without repeating one, unfortunately, has never met any of the Backstreet Boys before. Where are you from? : Atlanta, Ga.
What do you do for a living? (job, etc. ): I work in the IT field. Right now I’m working specifically as a software tester. It’s a lot of fun! Tell us a little bit about yourself: I’m incredibly passionate about music, from music theory to composing, to performing. I grew up playing piano and play by ear. Right now I mostly sing, though only for fun. I like to sing covers of songs and I occasionally write lyrics. My music taste is very expansive and stretches across many decades and genres. I’m very obsessed with the 90s/early 2000’s. The fashion, the music, the overall aesthetic, it’s my favorite. I love traveling and sightseeing, I’m a total tourist. How long have you been a BSB fan? : Since 1996 when I first heard about Quit Playing Games (With My Heart). I was only 9! My sister and I had this small little TV with rabbit ears that picked up a music video station called “The Box” and the video came on there in 1997. The rest is history! How did you become a fan? : As soon as I became aware of the Backstreet Boys, I was a fan. Through that first exposure and continuing to see their videos, listen to their music, and hear radio interviews, I was able to follow along on their journey. I was completely obsessed with their music and videos and I started buying anything and everything Backstreet Boys related. Clothes, journals, notebooks, jewelry, singles/albums, you name it. My walls were literally covered floor to ceiling with their pictures (a sentiment a lot of us fans can relate to). What is your favorite BSB memory? : So many to choose from! My first concert in 1998 was a big one. I begged my mom for tickets and I had the time of my life with my 2 best friends at the time. We all had our BSB shirts and lanyards and it was my first real concert. The Millennium era was huge for me. The Millennium tour blew my mind (and still does to this day when I re-watch it) and I remember being a part of the Millennium madness, running out to buy the album on release day and watching the guys on TRL promoting it with all of the screaming fans and chaos outside the studio. Definitely unforgettable! What is your favorite BSB video and why? : “Everybody”, hands down! How can you not love the video? The amazing makeup/special effects, the ballroom dance scene, the hilarious acting, it’s iconic. When I was younger, my friend and I memorized the dance and knew all of the moves. We would compete over who did the better rendition (truthfully, I think she won!). Who is your favorite Backstreet Boy and why? : AJ, for so many reasons. His strength in overcoming his addictions to become the person he is today is so inspiring and powerful. I was championing for his success and he didn’t let me down His struggles with having a lisp and stutter is very close to home for me as I’ve also experienced those same issues, so it’s meant a lot to me to watch someone I admire be open about that and makes me feel better about my own struggles with it. I love his kooky crazy personality; he seems to not take everything so seriously. His voice is liquid gold and I could listen to him sing the phonebook (and it would be perfect). He’s also really, really ridiculously good looking, duh. How has BSB impacted your life? : They provide me with so much happiness and give me so much to look forward to. If I’m ever having a bad day, I know their music, videos, or pictures will help make things a little bit better. I’ve struggled all my life with depression and one of the things that keeps me afloat is looking forward to what’s to come from them, be it new music, a new video, or a televised appearance. Their passion and dedication to their work is really inspiring. They’ve made my love for music even stronger and I feel so blessed having them in my life for this long. What is your favorite thing about being a BSB fan? : I love meeting other fans and talking about what we love about them. There’s so many of us and it’s great to get other people’s perspectives and hear their own stories of BSB’s impact on them. I love being able to share BSB with other people who aren’t as crazy as I am. People will see my BSB shirt and strike up a conversation about it or hear me blasting their music from my car at any given time and they’ll start to sing along. Above all, I just enjoy being able to be a part of their journey and long career. It’s incredible to me that because of social media, I can closely interact with them on a daily basis. I really feel like I know them! Have you been to Vegas? If so, how many times and if not, are you planning on seeing a show? : I’ve been to Vegas once, but BSB was not there when I went, unfortunately. I REALLY want to go see them this year, and would love to be able to finally meet them! What has been your favorite BSB moment over the past 25 years? : Kevin rejoining was big for me. Kevin was my favorite growing up and though I still was true to the BSB when they were a quartet, I always missed Kevin and having the 5 guys together. Kevin coming back was like a rebirth of the Backstreet Boys and I’m so glad he did. This new Don’t Go Breaking My Heart era has also been really exciting to watch unfold! Where do you get your ideas for BSB memes? : I’ve always loved memes, going back to the early days of the concept. It was only natural to delve into combining two of my favorite things (memes and BSB) into a cohesive idea. I was making some BSB memes here and there but started making them “full time” when I acquired the “backstreetboysmemes” handle on Instagram from another BSB fan who was also making BSB memes. I usually get ideas from other meme templates and mold them into a BSB theme, or I find pictures of the guys that look like they could be made into a meme based on their facial expressions, poses, etc. Really the inspiration comes from anywhere. I’m always looking for a way to turn a regular photo or cartoon into a BSB themed meme!